Come be a part of celebrating the joy of the Lord as we lead in worship through song. Sanctuary choir rehearses each Wednesday and is packed full of learning new songs, praying for one another and giving glory to God with our voices. The Sanctuary Choir is open to all adults. We have all ages and utilize a wide variety of musical styles. 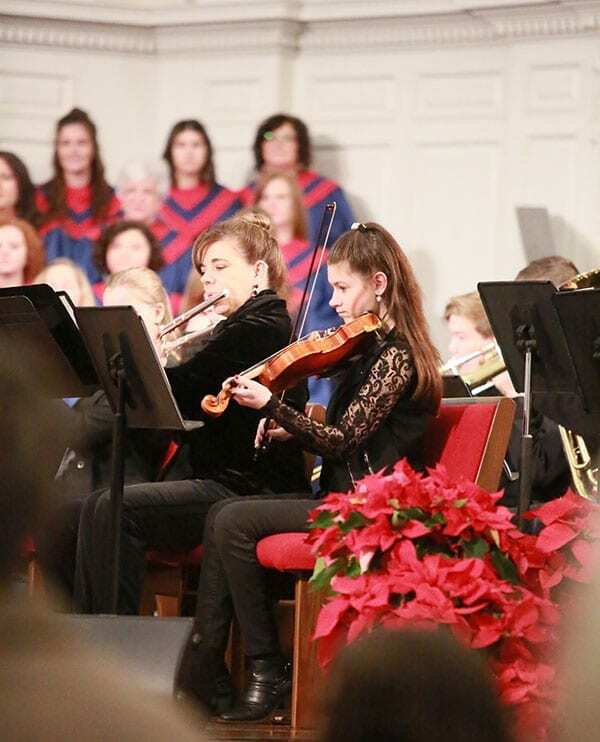 We enjoy a spirit of family as we share our diverse music tastes, our joys, and our sorrows in rehearsal and our exaltation of Christ each week in our 10:50am worship service. We prepare music well in advance, making it possible for those with less training to sing with confidence alongside those with more experience. 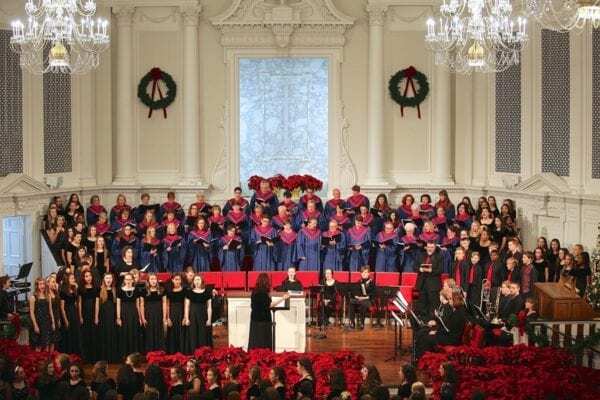 This choir sings for the 10:50 a.m. service on Sundays and presents pageants and programs for seasonal and special occasions. Workshops, guest clinicians, and other opportunities are offered to members, as well. sanctuary choirYou do not have to be a member of this church to be welcomed to the fellowship of this choir and to share in its ministry. Service: Sundays 10:50 a.m. – Warm-up time is 10:30 a.m. Exciting days are ahead for the Sanctuary Choir and FBC Orchestra as we prepare for Good Friday and Easter Sunday as well as our joyous times of celebration each Sunday. Childcare and homework room is provided for you and your family so come for personal growth, fellowship and the joy of making music for an offering. This group meets weekly and accompanies our 10:50am worship service music, as well as playing preludes and offertories. We are building a fine library of instrumental music. We encourage our instrumentalists to utilize this music for ensemble and for solo presentations. This group presents three major works each year: Christmas, Easter and Freedom Celebration in July. We invite all instrumentalists, brass, woodwinds, strings and percussion, to join us. 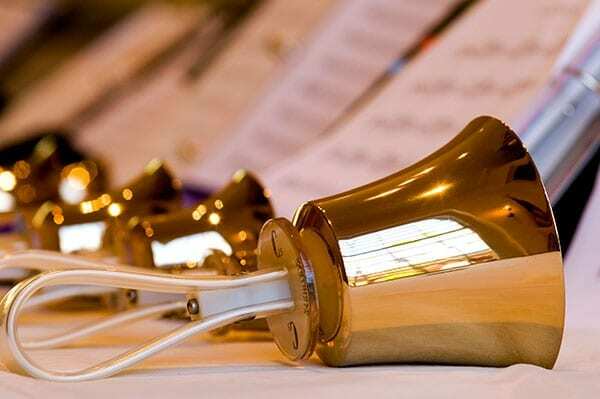 Rehearsals: Wednesdays from 6:30 – 8:00 p.m.
Great fellowship and music making that glorifies Christ Our Lord are the primary goals of First Baptist’s adult Handbell choir, Bronze Praise. We meet weekly on Sundays at 5:30pm for an hour of rehearsal time in the 2nd floor bell choir room (316C), and we lead in worship approximately 6 to 8 times each year. Our choir attends at least one regional handbell festival a year in order to improve our skills and to enjoy worship time together with handbell choirs from around the state of Georgia. Participation in Bronze Praise is open to experienced ringers. Ability to read music is prerequisite. If you cannot ring on a regular basis we welcome your commitment to serve on our substitute ringer list. Meets Wednesdays 4:15-5:00pm. This group rings our hand-chimes as they begin learning melody and group ringing. Comprehension of treble and bass cleft ringing, dynamics and rhythm are taught in this beginning group. Open for 6th-8th grades begin rehearsals January 2014. Learning the fundamentals of handbell ringing and technique as well as continuing music theory. Open for 9th-12th grades as we meet Sundays at 3:00-4:00pm (316C). Going the next level with more complex musical selections attending state handbell festival in the spring and touring each year with the Sr. High Choir in June. This choir is a major service choir, singing often for both morning worship services. 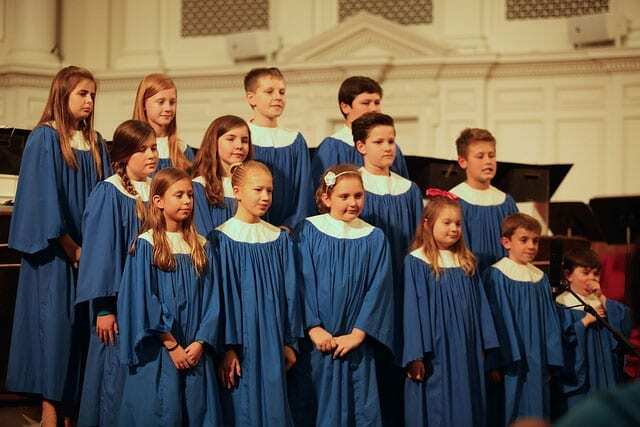 They participate in the annual Georgia Baptist Youth Choir Festival and annual mission trips. This choir tours each June and follows the mission given in Acts 1:8 “and you will be my witnessess in Jerusalem, Judea, Samaria and the utter most parts.” Thus each tour is either local in the state, intrastate, national or international.This choir has traveled internationally to Europe (2005), Japan (2009) and South Africa (2013) and Mystery Tours (as in no one knows where we are going) to New Orleans (2006), Arizona-Grand Canyon (2010) and San Francisco (2014). 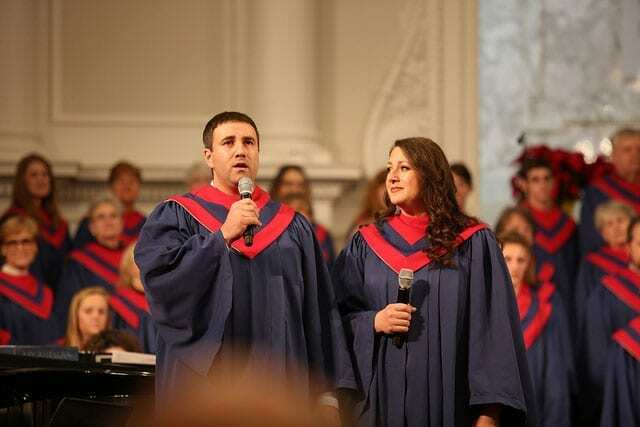 Choir provides opportunities to utilize talents and prepare for a lifetime of Christian service and fellowship as students memorize the truths from God’s word through song and share God’s love through word, deed or through music. Choir provides a supportive place for growth spiritually, socially, as well as musically during these years of changing voice and approaching adulthood for these youth. They also participate in activities such as festivals, retreats, and musical dramas planned just for them, as well as singing for worship services. Rehearsals: Wednesdays from 5:30 – 6:15 p.m.
We have seven children’s choirs that meet each Wednesday evening from 5:30-6:15pm following our church-wide supper at 4:45 pm. Our choirs have two major presentations each year. One at Christmas and one right before school is out. Each choir also has the opportunity to lead in our Worship services during the year. 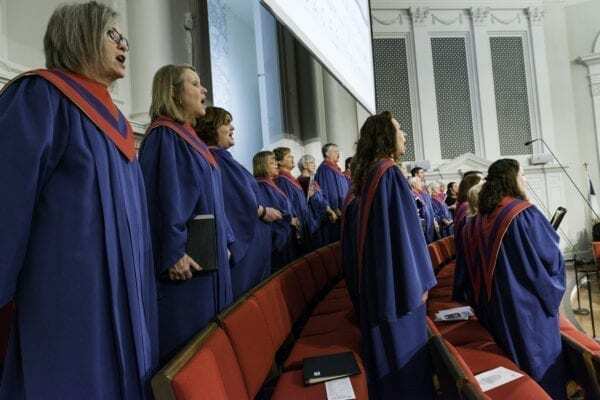 We have at least two adults and youth workers in each of our choirs that gear each rehearsal with hands on activities, musical learning and sharing, and gained biblical knowledge through the memorization of scripture songs. Good News (4th & 5th Grade)-Attend Young Musicians festival each February and are also eligible to attend the prestigious Young Musicians Camp each summer. Scholarships are awarded to any student who wants to attend and who have excellent attendance in weekly rehearsals. This choir will also present a major musical/drama each spring as well as leading in worship services. Chimes For Christ, -a handbell choir open to 4th & 5th graders and meets Wednesday evenings from 4:15-5:00pm. Would you consider having your child be a part of such a wonderful program of discipleship through song and scripture memorisation, encouragement and team building?